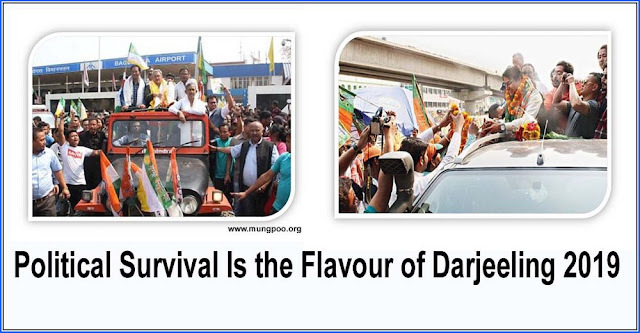 Irony seems to be the main stay of politics in the Darjeeling Hills. There was a chance for a potential non-Bharatiya Janata Party (BJP) and non-Trinamool Congress (TMC) alliance for the Lok Sabha elections. However, the two former foes of the Gorkha National Liberation Front (GNLF) and the Bimal Gurung faction of the Gorkha Janmukti Morcha (GJM) have banded together to support a BJP candidate. The TMC has predictably backed Amar Singh Rai from the Binay Tamang and Anit Thapa faction of the GJM. The irony is that the Gurung camp as well as the GNLF could have positioned themselves to make a principled stand in the elections, given that the Tamang-Thapa camp of the GJM is perceived to be controlled by Kolkata. Perhaps, a vain hope for third time lucky is what has prompted the alliance with the BJP. On March 11, a meeting was called by the GNLF, which was attended by the members from the CPM, Communist Party of Revolutionary Marxists (CPRM), Congress, Jan Adolan Party (JAP) and Akhil Bharatiya Gorkha League (ABGL). The idea was to agree on a consensus candidate who would contest from the Darjeeling constituency. The CPRM has suggested the name of Ratna Bahadur Rai who had previously served as a member for Parliament for the CPM in the short-lived 11th Lok Sabha between May 1996 and December 1997. The final announcement was set to be made on March 15, however, due to various reasons, the announcement was not made. Instead, the GNLF held a press conference where party spokesperson, Neeraj Zimba, reaffirmed that the party will back a consensus candidate no matter what. Here too, he mentioned the possibility of Ratna Bahadur Rai’s candidature. However, on March 20, the Gurung faction of the GJM as well as the Man Ghisingh and Neeraj Zimba led GNLF announced their decision to back Raju Singh Bisht, the BJP candidate for the Lok Sabha elections. The first time the BJP won the Darjeeling seat was in 2009. Jaswant Singh won the election, thanks to the tireless campaigning of the undivided GJM-led by Bimal Gurung. However, in 2013, protests broke out in Darjeeling when Telangana was created, mainly due to the fact that the demand for a separate state in the Darjeeling hills is older than India’s independence. A ‘missing person’ complaint was filed in Darjeeling against Jaswant Singh, as he had been absent from his constituency for a long time. In 2014, the GJM once again backed the BJP candidate, SS Ahluwalia. Perhaps, there was a sense that Gorkhaland did not happen, as there was no BJP-led Union Government. Hence, the logic in 2014 was that if a BJP government is formed, then Gorkahaland is extremely likely. What contributed to this belief was that it was the BJP-led National Democratic Alliance under Atal Bihari Vajpayee which created Chhattisgarh, Jharkhand and Uttarakhand in 2000. However, despite the agitation in 2017, which saw the hills shutdown for 104 days, 13 people killed and heavy-handed police action, the BJP maintained a silence. The political parties in the hills initially demanded a meeting with the Union Government to resolve the matter. However, the union government’s silence led to capitulation by the hill parties, who eventually held talks with the state government. This led to the downfall of the BJP’s star campaigner in the Darjeeling Hills, Bimal Gurung. The TMC government was quick to lodge a litany of cases against Bimal Gurung and his aides. This prompted the former strongman to go underground. Rumour has it that he shuttles between Nepal and Delhi to avoid detection and arrest. With Gurung out of the way, Anit Thapa and Binay Tamang were brought in to fill the void. Binay Tamang was appointed the head of the Gorkhaland Territorial Administration (GTA), despite it being an elected post. Perhaps due to the common perception that the GJM under Binay Tamang is actually a TMC front, the GNLF began regaining their lost ground in the Hills. The GNLF used to be the reigning overlord in the Darjeeling Hills since the armed uprising in 1986. Bimal Gurung was a former member of Gorkha Volunteer Corps (GVC) from the days of the GNLF’s armed movement for Gorkhaland. He later rose in the ranks of the GNLF and represented the Tukvar constituency in the Darjeeling Gorkha Hill Council (DGHC), an autonomous body for administering the Darjeeling Hills. However, his disenchantment with his former leader, Subhash Ghising, arose when the latter chose not to hold elections to the DGHC in 2004 until the creation of a new body under Schedule VI of the Constitution. Until the body would be created, Ghising would assume a caretaker role. In 2007, Gurung was expelled from the GNLF for anti-party activities. The same year, he launched the GJM while accusing Ghising of selling out the promise of a separate Gorkhaland state. The issue of the Sixth Schedule status for the hills arose due to the tribal population of the hills being very small. Of course, in this context, the ‘tribal population’ would refer to the legally recognised Scheduled Tribe (ST) status. Though the Union Cabinet had initially accepted the idea of creating an autonomous body for the Hills under Schedule VI, the GJM’s agitation resulted in frantic lobbying in Delhi until the matter was referred to a Parliamentary Committee, which then passed the buck onto the Ministry of Home Affairs to reassess the ground realities. Thus, the Sixth Schedule status was defeated. In 2008, Ghising was forced to resign as caretaker of the DGHC. In 2011, stability finally returned when the GJM signed a tripartite agreement with the government of India and the government of West Bengal to establish the GTA. In real terms, the only difference between the GTA and the DGHC was the use of the name ‘Gorkhaland’. Ironically, after Gurung’s ouster, the GTA led by Tamang and Thapa is colloquially referred to as GTA-2. In other words, only the faces have changed. The political equations at present seem to be more about political survival of the Hill parties rather than the Gorkhaland dream. Irony seems to be the main stay of politics in the Darjeeling Hills. There was a chance for a potential non-Bharatiya Janata Party (BJP) and non-Trinamool Congress (TMC) alliance for the Lok Sabha elections.